Certain surfaces are practically canvases for creativity, and the bathroom floor is a prime example. (Kitchen backsplashes are another)! Bathroom tiles are one of our favorite ways to introduce interest and wow factor to a space, and by clicking through to view a few of our favorites, we hope you’ll be as inspired as we are. Above, bright blue tiles make any nightly soak anything but routine. Soft grey chevron tiles act as the perfect complement to cool grey cabinets. A delightful look at monochrome. Graphic black and white tiles are the perfect match for the similarly striking brass fixtures. We loved this space so much, we Instagrammed it! Pattern within pattern – an instant way to make your floors pop! This bold pattern, soft in tone, doesn’t disrupt the calmness of this space. If you’re lucky enough to have this classic vintage tile in your bathroom, embrace it! Oversized scalloped tiles meet this regal claw foot bathroom in the most elegant way. Tiny bursts of color form a cheerful trail throughout this charming space. Holy hexagons! This multi-colored floor tile is the perfect partner to the monotone wall. 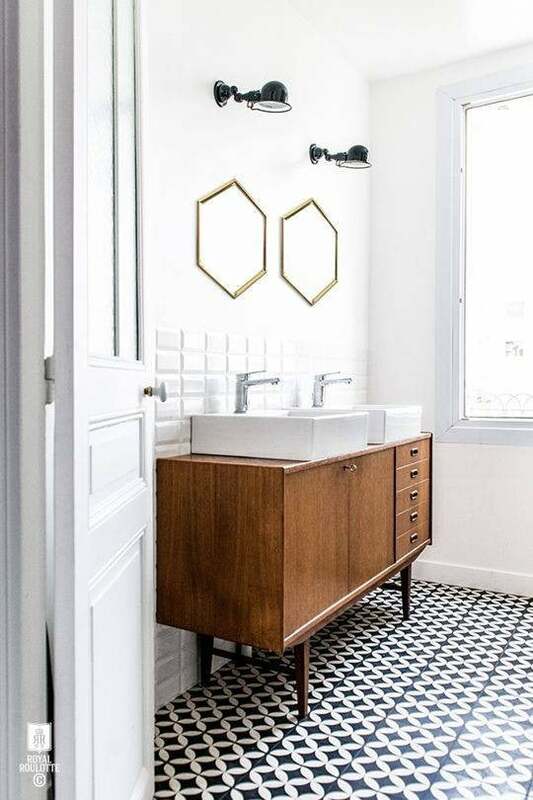 Go for bold with this tiny, repeating diagonal tile pattern. Everything about this bathroom, especially the floor tile, is absolutely magical. Even a black and white bathroom desires the right touch of tile. Sunny splashes of yellow will wake you up, as you enter your morning shower.